Walter (Boney) Charles Lisbony passed away April 23, 2017 at The University of Texas Medical Branch after a brief illness. He was born January 28, 1940 in Galveston, Texas. Walter worked for Houston Lighting and Power (Centerpoint Energy) retiring after 32 years. 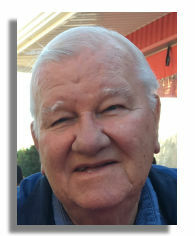 He was an avid sports fan and could be found always watching baseball and football. He could tell you the top players on any NFL or MLB teams, which brackets they were in, and usually pick the winning team. As well, he knew every Ball High football player that went pro due to his Ball High pride. Walter enjoyed college sports and was a huge Texas Longhorns fan. He played first base and was scouted by Major League Baseball teams while he was in high school for a position on a farm team. He also coached both his daughters’ softball teams and is fondly remembered by all of the girls and coaches associated with him during those years. Visitation will be held on Wednesday, April 26, 2017 from 4:00 P.M. to 7:00 P.M. at J. Levy & Termini Funeral Home Chapel. Funeral services will begin at 7:00 P.M, with Pastor James Lewis officiating. A reception will be held after the service at Zion Retreat Center, 6910 Yucca Drive, Galveston, Texas.